I was asked by Southern Living to create a few new gelatin recipes based on those we all grew up seeing on family reunion buffets. Truth be told, and I didn’t tell Southern Living, I stayed as far away from that jiggly table as I could get. Especially when it came to my grandma, Lula Mae’s Green Top Salad. Congealed salads are a little like dandelions in the South –they start showing up about this time every spring, are oddly beautiful, parts are edible and no matter how hard you may try –you just can’t get rid of them. Year after year, generation after generation…dandelions and congealed salads just keep coming back. When it came to dandelions and congealed salads, my family was no exception. My hog-farming Grandma Lula Mae was the champion of all things growing from the ground AND one particular congealment. Grandma had a personality and a sense of humor as big as her hair—which was exceptionally large on Fridays after her weekly shampoo and set—except when it came to her Green Top Salad. For that, Grandma didn’t joke around. Her prized jello salad consisted of a mixture of cream cheese, mayonnaise, marshmallows and pineapple layered in the bottom of a clear baking dish. 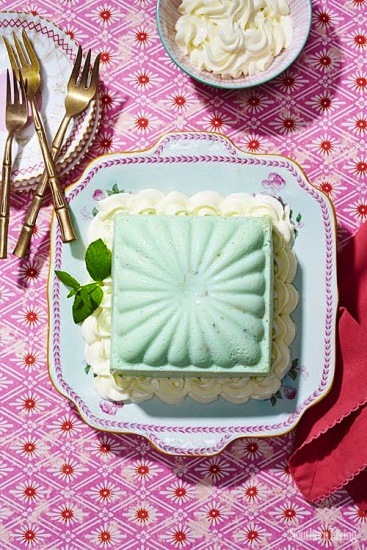 Lime Jello was the flashy jewel that covered the top… thus it’s name: Green Top Salad. Grandma claimed she came up with the recipe herself, but everyone in the family knew it came from one of the many women’s magazines she subscribed to. On one occasion, my Aunt Darlene questioned the recipe’s origin by telling Grandma she had seen it in a Betty Crocker cookbook. Grandma hit the roof! “Betty Crocker is a bore!” she screamed. “How could she ever think of something so clever?” I secretly loved every time Grandma called Betty Crocker a bore and never had the heart to tell her that Betty wasn’t a real person, Green Top Salad or not. Read the rest of the story HERE. Disclaimer: I had nothing to do with the video shown at the end of the story…nothing.